USA's Simone Biles (left) and team-mates celebrate winning gold in the Women's Gymnastics Team Final at the Rio Olympic Arena on the fourth day of the Rio Olympic Games. SIMONE BILES GOT her bid for a record five gold medals at the Rio Olympics off to a flying start as the United States women coasted to a team gymnastics title defence on Tuesday. 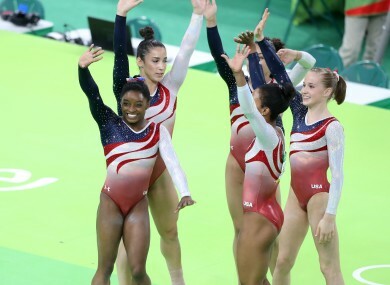 The five-woman US team — Biles, Gabby Douglas, Aly Raisman, Madison Kocian and Laurie Hernandez — claimed gold by a margin of over eight points on Russia with China winning bronze in the Rio Olympic Arena. “It’s everything and more than I’d hoped it to be,” said Biles, 19, who was too young to compete in London 2012. She has dominated women’s gymnastics over the past three years — winning ten world titles — and is looking to aad to her haul in the all-around, floor, beam and vault finals in Rio. The weight of expectation after leading qualifiers by over 10 points had only made them stronger, said Raisman, a gold medal winner in London. “We were heavy favourites, but we tried to use that pressure as motivation,” said the 22-year-old. The US women become the first team to win back-to-back Olympic golds since Romania in 2000 and 2004. It was their third gold after winning a first in Atlanta 1996. Three-time world all-around champion Biles was the only American to compete on all four apparatus — vault, uneven bars, balance beam and floor – with all scores counting and no room for error. She made it look easy as hit 15.933 on the vault, followed by 14.800 on uneven bars, on which world champion Kocian gave a spectacular display of aerial acrobatics to lead the way with 15.933. At the halfway point the US women were almost home and dry having already pulled over four points ahead of China and Russia. Biles wobbled slightly on the beam but held allowing the US to confidently stride into the final rotation on floor with almost a five-point lead on China. China’s Mao Yi slipped off the mat on the floor routine, ending the 2008 champions’ challenge for silver, after Shang Chunsong had earlier tumbled off uneven bars. And taking to the floor last Biles turned on an acrobatic display of tumbling to Brazilian Samba music which proved a hit with the home crowd to seal a victory which was never in doubt. The United States scored 184.897, with Russia scoring 176.688 with China, 176.003, returning to the podium after failing to medal in London. It was a return to the top of the podium again for Douglas, 20, who took two gold in 2012 but lost her all-around title after missing the cut for Thursday’s final. “Obviously the USA are much stronger now but in the future we will challenge again for first place,” said Mustafina, who won four medals in London. The former Soviet Union won the team event a record nine times with Russia winning their fourth silver medal. Brazil finished last in the eight-team final with Rebeca Andrade strumbling out of her final tumble on floor after Flavia Saraiva gave a tentative display on the beam. Japan failed to follow their men’s team onto the podium finishing fourth ahead of Great Britain, Germany, the Netherlands and Brazil. Email “Teenage prodigy Simone Biles leads US to gold”. Feedback on “Teenage prodigy Simone Biles leads US to gold”.